Spider-Man 2099 is a fictional Character, a comic book superhero created by Peter David and Rick Leonardi in 1992 for Marvel Comics' Marvel 2099 line. His secret alter ego is Miguel O'Hara, a brilliant geneticist living in New York in the year 2099 A.D. who is attempting to recreate the abilities of the original Spider-Man in other people and later suffers a related accident that causes half his DNA to be re-written with a spider's genetic code. 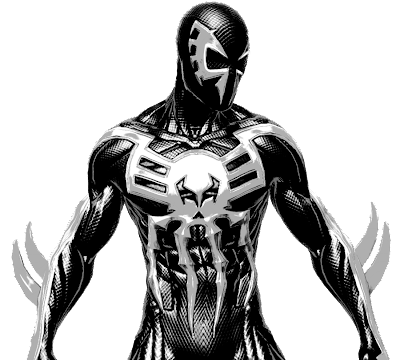 O'Hara is the first Latino Spider-Man - More about Spider-Man 2099 (Marvel Comics) Character Review...keep reading !! Early years - Miguel O'Hara is born in New York City, many years after the end of what his people's history calls the "Heroic Age", which is the modern day era of Marvel heroes. He grows up with his mother Conchata, his younger brother Gabriel, and the abusive father George O'Hara. A rebellious boy with prodigy-level intelligence, Miguel is an adolescent when he is awarded enrollment into the Alchemax School for Gifted Youngsters (heavily implied to be a renovated version of the X-Men's headquarters) in Westchester, owned by the powerful Alchemax megacorporation which also controls local law enforcement agencies. Here, he befriends Xina Kwan, a girl of similar intelligence who specializes in computers. Xina helps Miguel defend himself against the bully Kron Stone, son of Tyler Stone, Vice President of R&D for Alchemax. As adults, Miguel and Xina date seriously until Miguel cheats on her with Dana D'Angelo, who originally is the girlfriend of Miguel's brother Gabe. Later on, Miguel and Dana are engaged. Though seemingly arrogant and confident in all walks of life, Miguel is a very private man and trusts almost no one save for his apartment's holographic aid Lyla, an artificial intelligence programmed by Xina. Origin - Miguel eventually becomes head of the genetics program of Alchemax, intended to create new corporation-controlled super-powered soldiers called "corporate raiders." Miguel is specifically inspired by surviving records concerning Spider-Man and hopes to one day create a similarly powered person. But after a human test subject dies during an early experiment, Miguel tells Tyler Stone he wishes to resign from Alchemax and discontinue his genetics research. Rather than let Miguel leave, Tyler Stone tricks him into taking Rapture, an addictive drug that genetically bonds to the user. Tyler reminds Miguel that only Alchemax is allowed to legally distribute this drug, so if O'Hara does not remain with the corporation then Tyler must assume he is getting the drug from the black market and will be forced to tell the police. Not wishing to be a blackmailed addict, Miguel recalls that he entered his own genetic code into his machine's databanks during initial experiments, using it as a human DNA test sample. Intending to use this older template of his pure genetic code to write over his current biology and free himself from the Rapture, Miguel sneaks into Alchemax and uses the gene alteration machines on himself. After Miguel turns on the machine to rewrite his DNA, his jealous subordinate Aaron Delgado sabotages the machines, causing them to alter Miguel's genetic code to be "50% spider DNA." Miguel survives the process, but realizes he now has spider-abilities. Realizing that there is now a person with abilities similar to Spider-Man, Tyler Stone sends agents to hunt this person. To conceal his identity while he fights his pursuers, Miguel dons a bodysuit with a mask that he once wore for the Mexican Day of the Dead festival. Miguel chooses this costume in particular because it is the only clothing he has that is made from "UMF" (Unstable Molecule Fabric), meaning it is the only clothing he owns that will not be torn or shred by the spider-talons that now occupy his hands and feet. After seeing him operate in public, a group of Thorites (worshipers of the Marvel hero Thor) come to believe that Miguel is the legendary Spider-Man back from the dead and that he is the harbinger of Thor's eventual return. Heroic career - Originally focused with finding a cure for his condition, Miguel's further adventures as Spider-Man 2099 cause him to realize how ignorant of the world he was and how he had turned a blind eye to the oppression and pain the corporations of the world have caused. He is also surprised at the effect his presence has on the people who have been oppressed for so long, particularly his own mother, who ironically also hates the man her eldest son has become, admires the exploits of Spider-Man 2099. After this, Miguel decides to embrace his identity as Spider-Man. Donning his costume, he publicly proclaims himself to be an enemy to all the megacorps, saying he will use his powers to fight for ordinary people against those in power who abuse their influence and authority. Later on, Miguel discovers that an arrogant scientist at Alchemax called Jordan Boone is conducting "Virtual Unreality" experiments to create a doorway into another dimension. These experiments lead to the release of two mysterious figures: the Net Prophet, called "the prophet of Thor" by the Thorites, and a powerful megalomaniac called Thanatos. The Net Prophet becomes a new ally to Miguel. 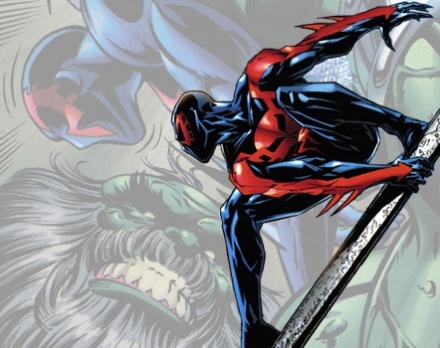 Since the Net Prophet is believed to be Thor's prophet, his association with Spider-Man 2099 leads more people to believe that Miguel's alter ego is the harbinger of Thor. In the "Time Flies Saga" that occurs years later in Peter David's Captain Marvel series, it is revealed that the Net Prophet is actually the hero Justice (John Roger Tensen) and that Thanatos is a corrupt version of Rick Jones from Earth-9309. The first major crossover of Marvel 2099 happens when Miguel and Dana visit Alchemax's floating city "Valhalla" and are startled by the sudden appearance of two men claiming to be Thor and Heimdall, respectively. It is later discovered that Alchemax CEO Avatarr has transformed ordinary people into duplicates of the Asgardians in order to eliminate the rising influence of new superheroes over the public. By joining forces, Doom, Ravage, the Punisher (Jake Gallows), the X-Men, and Spider-Man 2099 are able to defeat the fake Aesir and Valhalla falls. Miguel later learns that Gabe is aware of his double-identity, having recognized Spider-Man's costume from what Miguel wore to the Day of the Dead festival years ago. Gabe has grown a bit resentful of Miguel's new heroic career, particularly since his girlfriend Kasey seems enamored with the costumed Spider-Man 2099. After his holographic aid Lyla suffers a serious malfunction, Miguel asks for repairs from his ex-girlfriend Xina. Dana later accuses Miguel of cheating on her with Xina and Miguel becomes angry about this and about Dana's noticeably increasing interest in Tyler Stone. The two break up and Xina and Miguel become companions again..
Miguel O'Hara is a highly skilled geneticist and gifted with genius-level intelligence. Though he did not take combat training, he quickly develops an effective fighting style that maximizes the use of his superhuman agility, strength, senses, and intellect. After having half of his DNA re-written with the genetic code of a spider, Miguel develops a wide array of powers. He has the proportionate strength, speed, and agility of a spider. If his strength is equal to that of the original Spider-Man, he should be able to lift a maximum of approximately 10-15 tons and leap roughly 30 feet in the air. His speed allows him to dodge gunfire from a short distance away and move several times faster than a normal human being can. His superhuman agility and dexterity allow him to perform complicated acrobatic and gymnastic maneuvers that would be impossible for even the most highly-trained athlete and help him achieve and regain perfect balance even under extraordinary combat situations. Access to these abilities are largely instinctual, due to his re-written genetic code. Miguel's powers give him increased vitality and resistance to injury. He once suffered a punctured lung, broken ribs and major abrasions, and was still able to make it to a hospital where doctors said only his amazing constitution kept him alive. His metabolism allows him to heal a few times faster than a normal human, although he does not have a superhuman healing factor such as Wolverine. Unlike the original Spider-Man, Miguel O'Hara does not possess an extra-sensory "spider-sense" or "danger-sense" that warns him of oncoming threats. On the other hand, Miguel possess enhanced vision and hearing, which the original Spider-Man did not have. He can see in complete darkness and can accurately perceive and "zoom-in" on people and objects that are a great distance away. Thanks to his enhanced vision and reflexes, he can accurately perceive objects in motion that a normal person would see only as a blur. Miguel's hearing is also enhanced, though not to the extent of his vision. Spinnerets in his forearms enable him to fire an organic adhesive substance from the top of his wrists, usable in a wide variety of ways. Like the original Spider-Man (Peter Parker), Spider-Man 2099 can travel at high speeds swinging on "web-lines" when necessary, and he can use his webbing to ensnare enemies. Over time, this webbing loses its tensile strength and can be removed. Although the original Spider-Man is able to have any part of his body (such as his back) adhere to surfaces through unknown and invisible means, Miguel can only cling to surfaces with his hands and feet due to angled talons protruding from his fingers and toes. These talons are not retractable but can fold down when Miguel concentrates and do so automatically when he touches his own skin so that he does not injure himself (of which he is particularly thankful to discover, as he remarks that otherwise, "going to the bathroom would be an adventure, and picking [his] nose would be lethal"). Though only approximately an inch in length, Miguel O'Hara's talons are capable of easily slicing through flesh and plastic. They can even rend metal armor, possibly because they are also enforced by Miguel's enhanced strength. 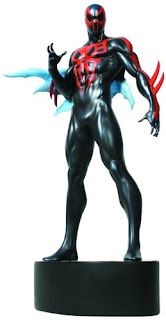 Spider-Man 2099 possesses venom glands and pronounced, pointed canine teeth. When he bites a foe, he can release a toxin that temporarily paralyzes his enemy. While the exact makeup of his venom has never been discussed, it seems powerful enough to affect such foes as Thanatos and it differs from real spider venom in that it does not seem to act as a digestive agent. Appearance - A side-effect of Spider-Man 2099's enhanced senses is that his eyes gained red irises and are now overly sensitive to light. To protect himself from being blinded and to hide his strangely colored eyes, Miguel makes a habit of wearing sunglasses. When Spider-Man 2099 uses his enhanced sight to zoom-in on an object that is far away, his eyes often become completely white, with no visible irises or pupils. Miguel also cannot retract his fangs and so has had to learn how to speak in a way that does not reveal his strange teeth. On occasion, this has caused others to accuse him of mumbling. Since Miguel has organic spinnerets, pressure on his forearms has occasionally caused him to release webbing without meaning to. Likewise, when Miguel has lost his temper, his talons have occasionally popped up from his fingers in response. 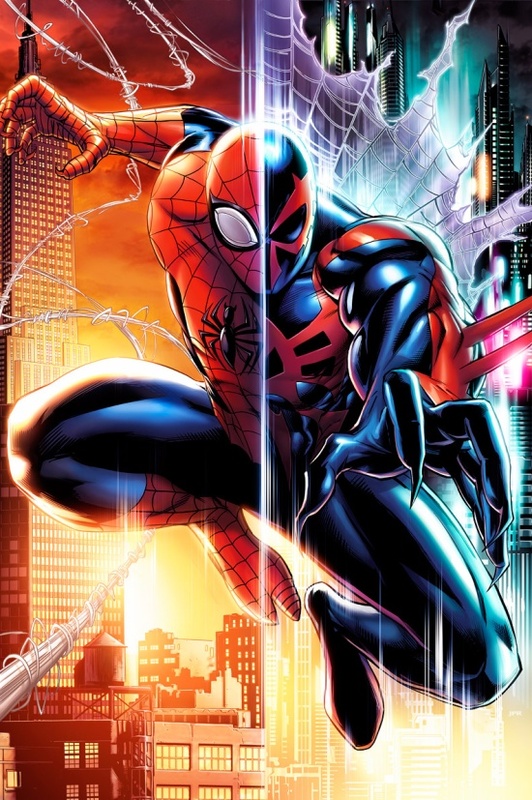 Paraphernalia - Spider-Man 2099 has a small, web-like airfoil attached to the back of his costume, which fans have sometimes called a "web-cape." The material for the air foil was obtained from a Thorite's hang-glider and is made from a material called "Lyte Byte" which is specially made to capture and direct air currents and gives off a low-level of anti-gravity particles. 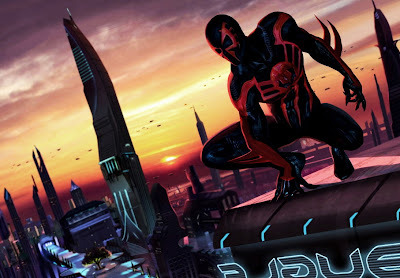 This allows Spider-Man 2099 limited gliding abilities, valuable since the New York of 2099 has massive sky scrapers that are often too far away for him to fire a web-line for travel. The Lyte Byte material also allows him to shift direction while in free fall and is very good at slowing down his descent, allowing him to fall from great distances without reaching terminal velocity. However, this does not grant Spider-Man 2099 actual flying abilities; he cannot hover nor can he simply rise into the air at will. Spider-Man 2099's costume is made from Unstable Molecule Fabric or "UMF." Originally invented by Reed Richards of the Fantastic Four, this fabric was made to be indestructible and was designed to interact with super-powers without hampering them. Miguel uses his talons through the UMF gloves and boots without tearing the cloth. The UMF does not dull the strength or sharpness of his talons in the process. The UMF costume has also offered Spider-Man 2099 limited protection from energy weapons, as the energy blasts could not penetrate it. However, this did not prevent Miguel from suffering the impact of the blasts, and he was still seriously injured. Likewise, if Miguel fell from a great height, the UMF would not protect him from the impact of landing, it simply would not tear in the process. While in costume, Miguel often reinforced his mask with webbing so that enemies could not remove it if he were captured or disabled in some way. A Spider-Man 2099 animated series was in development in 1999. However, it did not have connections to Spider-Man's supporting characters. It was later shelved in favor of Spider-Man Unlimited..